amanda's second annual valentine's day swap* has been afoot for the past couple of weeks, so i've been wandering around muttering about owl-faces and paper. i love making things out of other things, but i'm not very good with deadlines - and knowing i wanted to make jamie a barn owl out of patio furniture fabric (long story) didn't mean i knew how i was going to do so. but! the owl came to be. the card was a bit of a head-scratcher as well; i considered trying to make elementary school handwriting paper with lines from a photo of the F train subway tracks, but i didn't have a good, bright paint pen, and my glitter experiment looked like a sneeze. i knew i wanted to do something with a photo, ideally something with a boat on the river, if only one would happen b...and then a tugboat chugged past the window just as i was leaving for work, so i dashed out to the balcony with my camera. not sure how the neighbors felt about the random river-looker yelling NO CAT NO, but hooray, valentine! i completed the trio with some brooklyn jam, the box o'love made it to california in time, and manray sat in it. a fine conclusion, no? *in which one sends one's assigned blogger a small gift, a little something, and a handmade valentine. i met rachel the crafty kitchen sorceress when we were paired last february, and a year of marvelous recipe inspiration ensued. The nowl turned out SPLENDIDLY, L. And the heart-ridden tug is an utter delight. I'm also fairly sure the whole universe balanced out, if even for just a moment, some 12 hours ago when Manray attempted to make like a Lauren, box-wise. I feel mildly responsible for said balancing, and it feels good. Re clever book titles: "Manray Sat in It"? i know it's twelve kinds of gauche to post about swappin' before a package arrives for me and/or jamie talks about it herself, but i was so! excited! about sending this one. i love your swap, A. That is the best hand made owl ever. 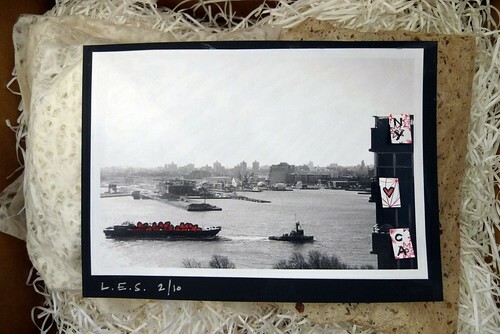 The barge is kind of brilliant too. Love the swap! Your contribution looks amazing (not that it's a big surprise!). it really is the best handmade owl ever. i should know. i am so lucky. and that photo! what is that owl doing there with those cactus plants? he KNEW he was going to live in the desert. and the hearts IN the boat are just too much. oh, the pages I could fill if we changed the title to "Manray Sat 'On' It." Amanda you are responsible for much balancing. ps L your social networking is by someone with the same initials as me. ok, so i saw the barn owl on jamie's blawg. and manray sitting in the box. and i coveted all of the above. do you do *burrowing* owls? i'm v. v. impressed. 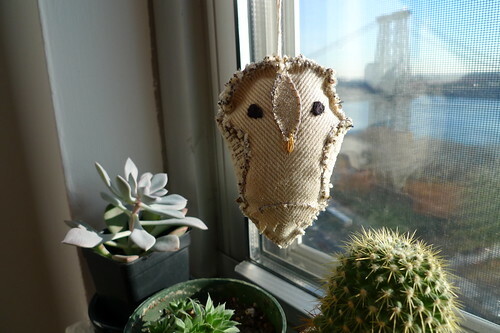 with both your owl AND your healthy-looking succulents. hooray for amazing amanda to orchestrate all this. @lily I KNOW I can barely manage them in San Diego! 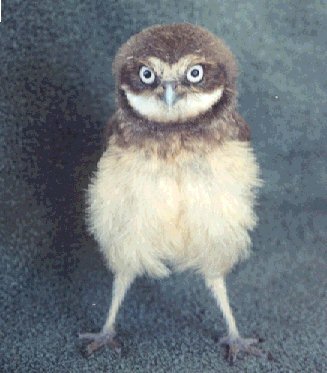 There used to ee a small family of burrowing owls on some property near my moms old house when I was a teenager. I am sure there is a house there now. :( do you see many out in the high des??? thanks, folks! i won't lie, i'm very pleased to be able to add birds (okay, *a* bird) to the softie arsenal. i'm most comfortable making insects and fish, so it was exciting to make something warm-blooded and non-freakish (we will not speak of the failed giraffe of 2008, or the armadillo-wot-wasn't (for loobylu's month of softies years ago). i could...probably make a burrowing owl? one doesn't really figure these things out until one's actually playing with the fabric. when one is me, that is. are they a good thing or a bad thing? google tells me that they are cute as hell, and that little adolescents like that one make a buzzing noise when threatened (which i myself might have done as an adolescent, had i thought of it). really, succulents don't like the dryness? it could be that they're suckers for punishment; i'm very bad about watering them, and the guy at the greenmarket implied they were into that. Burrowing owls will HAVE to bounce up and down. I've seen them. Little bitty things, out by the SF Bay. That's the cutest owl made out of recycled fabric. Love it!